Your camera’s sensor is a blank canvas onto which you can place whatever you like in the frame. Within that 3-by-2 box there’s ample room for manoeuvre. The typical approach is to come in tight and cram the frame with detail, but sometimes it might be more effective to leave parts of the frame empty in order to create a different mood. We call the empty parts of a frame ‘negative space’. This is typically anywhere that is either lacking in detail, blurred or otherwise plain and unformed. By contrast, the ‘positive space’ will be areas of interest, such as your subject or other notable details. Just because the rest is ‘negative’, it doesn’t mean it’s a bad thing. If we play with the balance between positive and negative space we can produce strikingly bold compositions, especially if we intentionally overemphasize the negative space. The key is in understanding how negative space can change the mood. It’s about knowing when to come in tight on something important, and when to back off and use the space to tell the story. At an iconic location it can be hard to find an approach that hasn’t been done a hundred times. But remember, while we might not have a great deal of control over the look of the subject – or rather the positive part of the frame – we can still control the negative parts. So why not try framing boldly like this for an unusual take on a familiar subject? To get a feel for negative space, why not revisit a few old photos from your image library and experiment with different crops? This is an exercise in seeking negative space, so any subject will do – a building, person, flower – whatever you like. 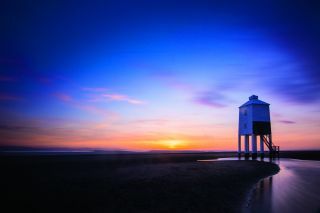 The iconic lighthouse at Burnham-on-Sea was our choice, a lone structure in a wide open beach. While not essential, a tripod helps to perfect your composition. Experiment by moving the subject around to different corners of the frame. You’ll get different results depending on whether you change the camera angle, or get up and move to a different spot. A wide-angle zoom lens, like the 16-35 used here, can be very useful. As well as the placement of the subject, we can create negative space with depth of field by blurring parts of the frame. A wide aperture, like f/2.8, helps achieve this, but also try getting up really close to surfaces to emphasize the blur – the camera was on the ground here. As well as blurring with focus, we can also blur out detail using a long exposure to soften details in the negative space. This works particularly well with moving water or clouds. In full daylight you’ll need a strong neutral density filter and a tripod for exposures of 30 seconds or more. A classic compositional device is to create a frame within a frame by composing through objects so that they surround the subject like this. Here the out-of-focus legs of the lighthouse become part of the negative space, framing the dog in the distance. Differences in light can help to create expanses of negative space. Here the lighthouse makes a strong silhouette, while the fading light results in moody dark negative space across the beach and sky. Look for contrast and expose for either the shadows or highlights.